CreditCards.com is an independent, advertising-supported comparison service. The offers that appear on this site are from companies from which CreditCards.com receives compensation. This compensation may impact how and where products appear on this site, including, for example, the order in which they may appear within listing categories. Other factors, such as our own proprietary website rules and the likelihood of applicants&apos; credit approval also impact how and where products appear on this site. CreditCards.com does not include the entire universe of available financial or credit offers. Good to Excellent Credit Recommended (670-850) ? CreditCards.com credit ranges are a variation of FICO® Score 8, one of many types of credit scores lenders may use when considering your credit card application. ? CreditCards.com credit ranges are a variation of FICO® Score 8, one of many types of credit scores lenders may use when considering your credit card application. 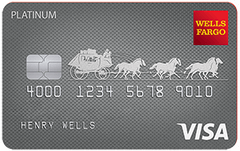 Our take: When it comes to paying down credit card debt, the Wells Fargo Platinum Visa card is one of the best cards out there. Its longer than average intro APR and no annual fee give you the cushion you need to make progress. All reviews are prepared by CreditCards.com staff. Opinions expressed therein are solely those of the reviewer. The information, including card rates and fees, presented in the review is accurate as of the date of the review. ADVERTISER DISCLOSURE CreditCards.com is an independent, advertising-supported comparison service. The offers that appear on this site are from companies from which CreditCards.com receives compensation. This compensation may impact how and where products appear on this site, including, for example, the order in which they appear within listing categories. Other factors, such as our proprietary website's rules and the likelihood of applicants' credit approval also impact how and where products appear on the site. CreditCards.com does not include the entire universe of available financial or credit offers. CreditCards.com credit ranges are derived from FICO® Score 8, which is one of many different types of credit scores. If you apply for a credit card, the lender may use a different credit score when considering your application for credit.